The Statue of Liberty was conceived by a group of French intellectuals in 1869. From Paris to New York her path took sixteen problem-filled years. From the start she had to beg for funding. Hundreds of thousands of ordinary citizens, even children, in France and the U.S. gave what they could. 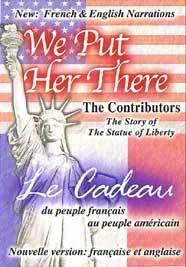 She was the symbol of French participation in the American revolution, and has become symbolic of freedom worldwide.